Born in New Jersey, Alan Pasqua began studying piano at the age of seven, playing both classical and jazz. 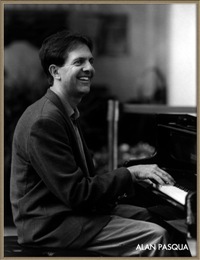 He attended Indiana University and received his Bachelors Degree in Jazz Studies from the New England Conservatory. After making his debut with the legendary "The New Tony Williams Lifetime" band along with guitarist Allan Holdsworth, he relocated to Los Angeles. A versatile pianist and keyboard player, his rock and pop credits are broad and impressive: Eddie Money, Bob Dylan, Santana, Pat Benatar, Ray Charles, Joe Cocker and Ry Cooder, among many others. As a jazz musician, he has played and recorded with Jack Dejohnette, Paul Motion, Dave Holland, Michael Brecker, Randy Brecker, and the list goes on and on. Most notably, Pasqua has been a co-leader of a trio with the legendary drummer Peter Erskine. The trio has released "Live At Rocco" and "Badlands", both on the Fuzzy Music label. Both recordings have received critical acclaim. "Body and Soul", a trio recording of Alan's with Darek Oles, bass, and Peter Erskine, drums followed as a Japanese release on the VideoArts label. Currently, he is an Assistant Professor in Jazz Studies at The Flora L. Thorton School of Music, The University of Southern California in Los Angeles.